At the western end of Loch Tay, overlooking the beautiful River Lochay, the Killin Hotel offers en suite rooms, a riverside bistro and a popular local pub. Parking is available and free WiFi is available in public areas and most rooms. 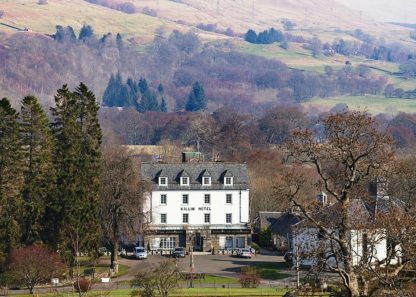 Built on the site of a 17th-century inn, the Killin Hotel sits opposite the local bowling green, tennis courts, putting green and park. Killin Golf Club is a short stroll down the road. Each room is en suite and comes with a TV and tea and coffee facilities. The property has an additional 5 rooms in the annexe building behind the hotel. Enjoy the relaxed conservatory and sun terrace in summer, while in winter you will find a welcome log fire in the cosy lounge-bar. Bring a laptop and you can use the free Wi-Fi. With a fantastic view of the river and the mountains beyond, the bistro uses the freshest local ingredients from quality Scottish producers. Loch Lomond & The Trossachs National Park can be reached in 45 minutes by car, whilst both Glasgow and Edinburgh are under 2 hours drive away.